I never thought it was possible for a dermocosmetic brand to come up with an eyeshadow this good, but it's apparently possible!!! I don't know if it's just me, but I usually feel that dermocosmetic brands cater to the niche markets, or the people who cannot use other brands. Be it due to allergies, eczema, or other sources of skin sensitivity, the usual client is trying these brands out because of those reasons. 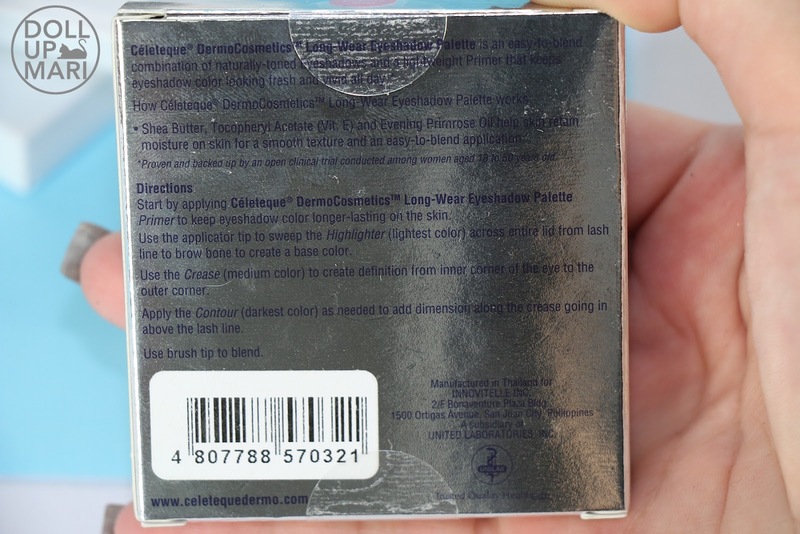 I was initially skeptical that a hypoallergenic eyeshadow offering made for sensitive skin would be chalky, unpigmented, and basically boring. But I was proven very, very wrong. These eyeshadows are mindblowingly pigmented and buttery that they can compete against mainstream brands and win. I am so happy to be sharing my delight with Céleteque's eyeshadow quads! They came up with three matte loaded quads that will prove to be very useful for everyone. Ever since my mom tried these, she happily uses these quads everyday. 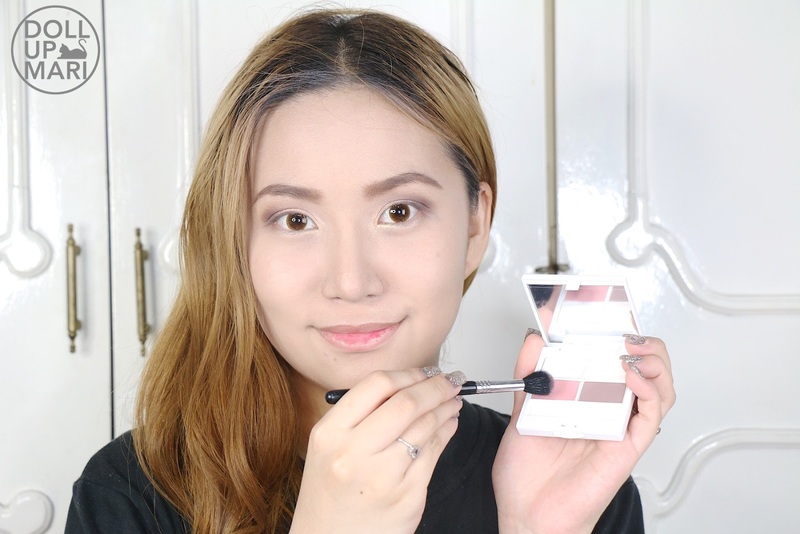 She, too, never thought that someone with extremely sensitive skin like her could still slay her eyeshadow game without fear of excessive fallout or adverse skin reactions. This Pink Orchid quad is my mom's favorite one. Shade Selection: This collection comes in 3 quads, a warm browns quad, a pink and brown combo, and a smokey grey and black quad. The shades are mostly matte, with the exception of some satiny ones. 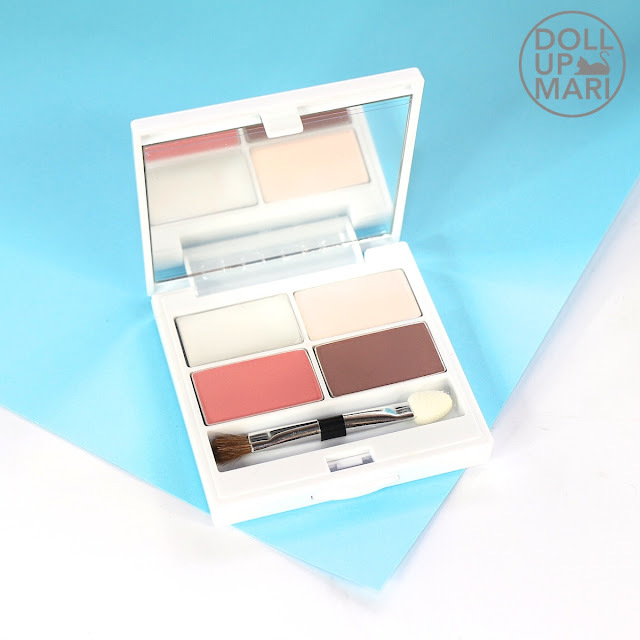 All quads come with 3 eyeshadows, with an eyeshadow primer balm, a highlighting shade, and two eyeshadow shades. I personally like the shade selection for the whole collection because all the shades in this collection are super wearable and basic. No crazy colors that will end up unused. Everything is practical and flattering on many skintones. Regardless of which quad you end up buying, all the shades are bound to be useful. I personally hate it when brands pair up useful browns and mauves with crazy lime shades in a palette, because we all know that the lime one will end up untouched even when the browns hit the pan. I want palettes and quads that are either all crazy or all tame so that there is a recurring theme. Color Payoff: I was suuper impressed that the colors of these eyeshadows translate so well from the pan! I usually have issues with eyeshadows with monochromatic shades because if the quality is not good, the shades will end up looking the same. 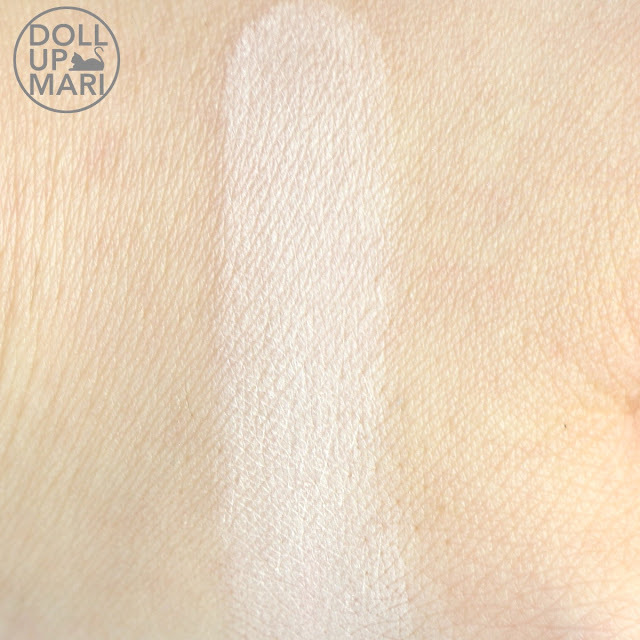 With this collection, monochromatic shades look discernible when swatched. Pigmentation: These eyeshadows are high in pigmentation. I hate it when I blend eyeshadows and then the intensity waters down. I also have a hard time looking for matte shades that appear well. But these eyeshadows reach a good level of intensity fairly easily, and do not water down once blended. I can see each color properly on my eyes as I apply them despite the shades being mostly matte. The primer is a big help, but I was so impressed that even without the primer, this still works as how I want it to. This also works well with my other primers, so I appreciated that part, too. 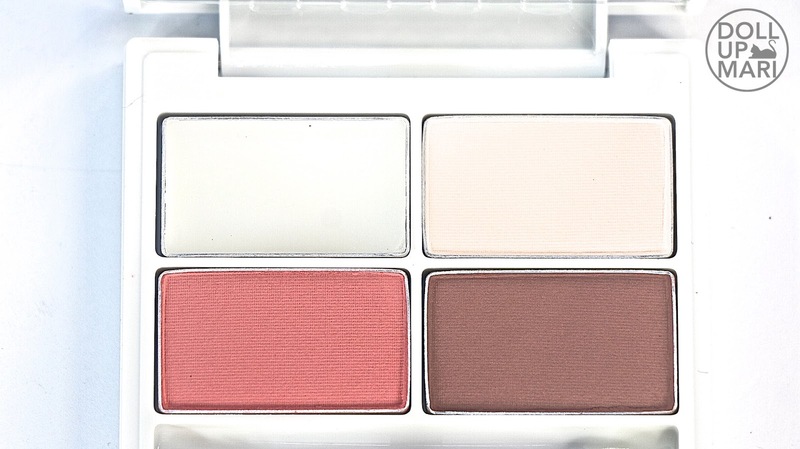 Texture: These eyeshadows are buttery, soft, and easy to work with. These are not chalky and will pose little to no problems to people who are sensitive towards fallout. This also doesn't have much fallout in general, and will not dust off brushes prematurely as they have a good cling on the skin. 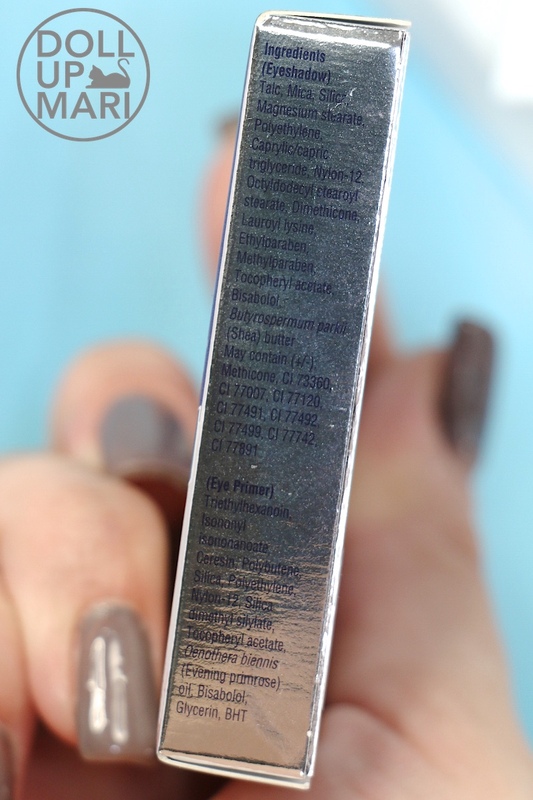 The primer feels like a soft balm and is the right balance of being just the right kind of moist and sticky. It's thin, wispy, and doesn't feel oily or heavy. Longevity: I used this for roadtests, but my mom ended up using this everyday now. I can say for sure that when she applies this in the morning, I still see her with eyeshadow at the end of the day. She likes to use the built in primer as it helps to prevent fallout. She has taken these quads to the salon on several occasions because she loves her makeup being done with this collection. And thus far, regardless of what the makeup artist does with these shadows (I'm not sure if they use the primer or not), they last on her all day. On myself, I saw no fading issues whatsoever. 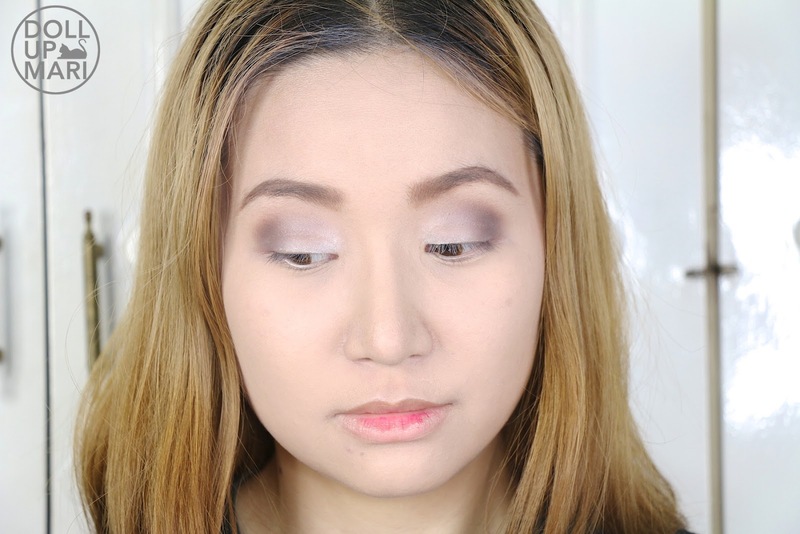 Even as I was blending other shades into my looks, these eyeshadows would stay put. Value For Money: Each quad is at Php725 and I know it sounds so expensive given that there are plenty of brands that can give more eyeshadows at the same price. Heck, if you go to the flea market 700 may already get you a 100 shade palette. But what differentiates this is quality and practicability. The eyeshadows reaaally are very very buttery and pigmented especially for matte ones. And all the shades are the shades that we'd normally like to use for everyday. If you're tired of wasting so much time every single day repiling and repiling your cheap eyeshadows on because they keep on fading as you go, then you would reaaally want this collection in your life. 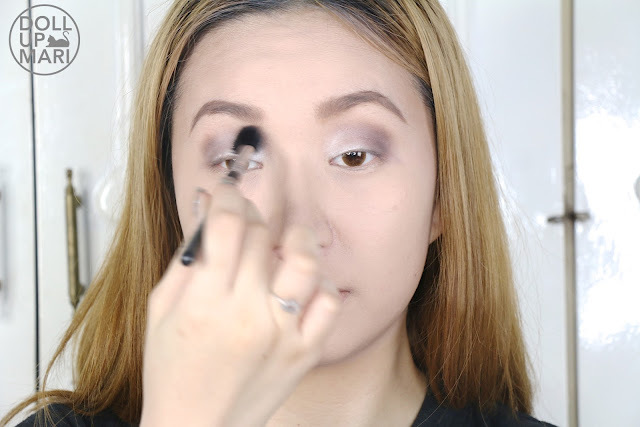 This will save you so much time because they blend easily and pack intensely. 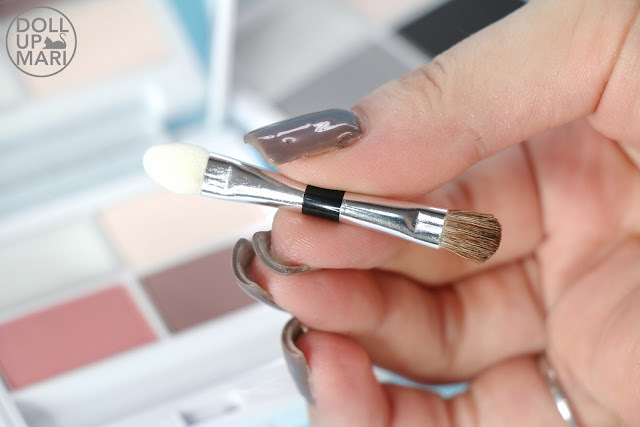 I do believe that you would need to buy your brushes to maximize these shadows because the applicator it comes with will not bring out the greatness of the shadows. 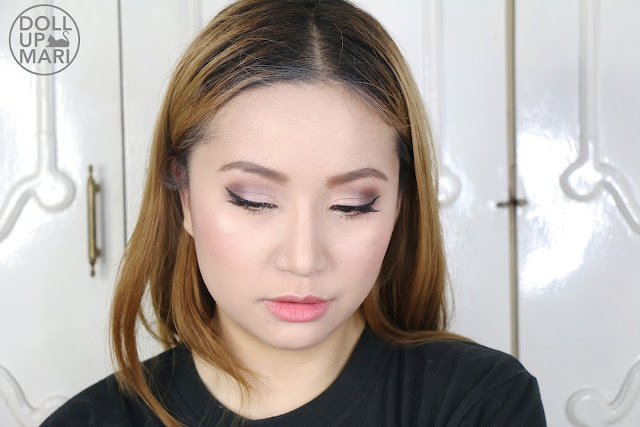 The typical foam applicator and baby brush applicator will not do justice to these shadows. And personally, I thought that given the price, they could have thrown in a nicer applicator. But if the shadows are to be talked about, they're worth every penny. Overall Feedback: These are professional quality eyeshadows and I am so impressed. I threw out all my first impressions off the window when I got to try this. I reaaally thought that since these are hypoallergenic and stuff that they'd be bland, unpigmented and chalky. But they're the opposite of all the stereotypes I put on them! These shadows are comparable to MAC and Urban Decay, and once you think of it that way, given that MAC and Urban Decay charge the same price for 1 eyeshadow, this is already a steal for an eyeshadow quad with mirror. This is the applicator I was talking about. I mean it's not the worst one I've seen, but it could've been a little bit more legit. And finally, this is the quad. The top left is the primer and the rest are the eyeshadows. I don't have a swatch of the primer anymore because it's invisible. 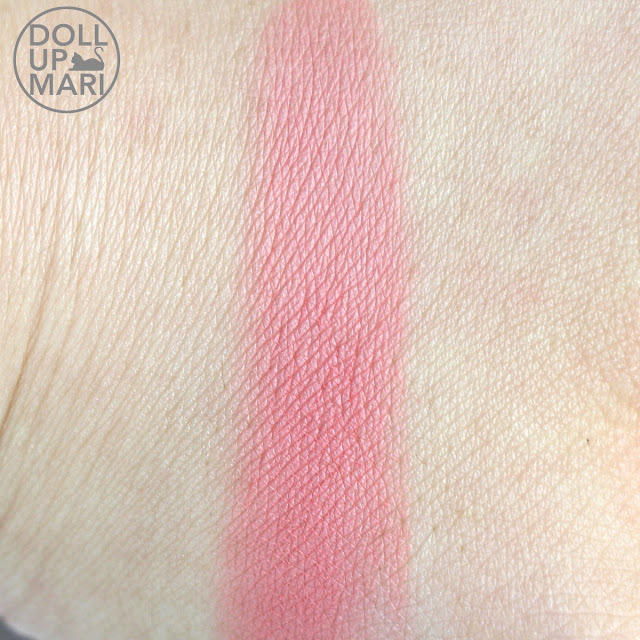 This is the blush pink shade they have. 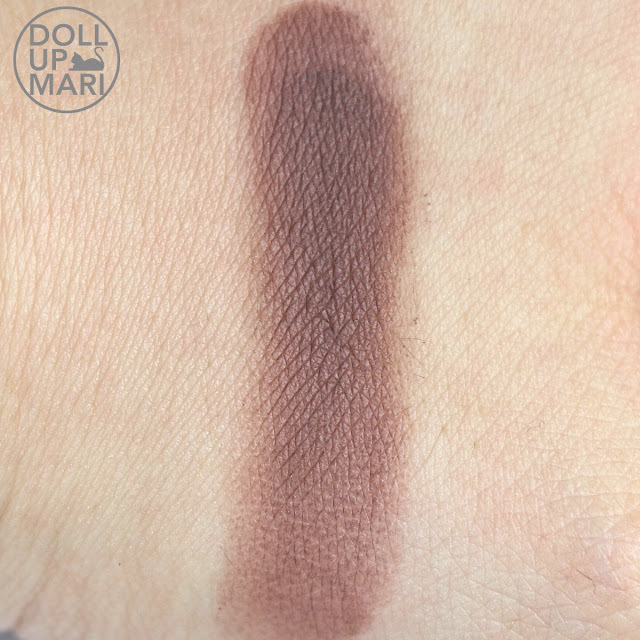 Up front, this color alone may not be so useful for the eyes, but this is a lovely color for the cheeks. This also blends very well with the brown one to create a beautiful mauve, so you guys needn't worry about making your eyes look swollen. They also have this warm chocolate brown. This is also matte, and since it's quite dark, it's nice to work with as you can buff this like crazy and it won't wear off. And there is this matte off white highlighter shade. This is mostly matte with a tiny bit of a satiny feel. The nice thing is that this won't make your look oily or sweaty. This is me in demo mode! As a transition base, I used MAC Espresso already. Now I am proceeding to use my Sigma E40 brush on the dark chocolate color. I was playing around with just softly buffing the color on with this look. But alternately I could have also used a pencil brush for a more defined crease or a paddle brush to pat it on instead in a more intense manner. I use a buffing brush to just softly buff it out on my eyelids. And now I proceed to pick up the pinkish pigments with the same brush. I ended up not using the white one sorry hehe. So here it is a little more mauve on the sides and the crease area. I used Anastasia's Highlight Kit on the eyelid area. And this is the final result after the eyeliner and lashes. 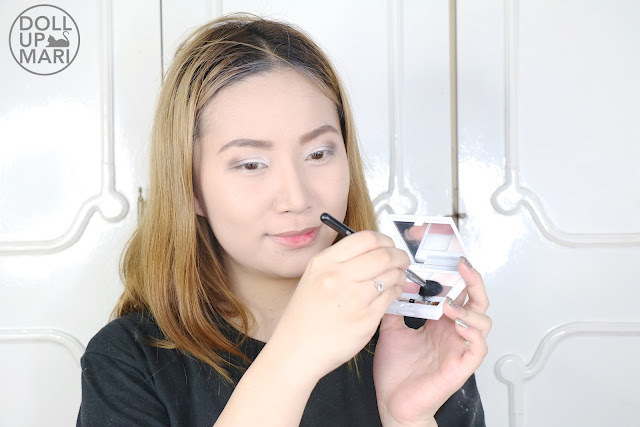 I used Sigma E06 special winged liner brush to get my eyeliner to wing like this! Wow. Perfect combination po yan madam. Bagay po sa inyo. 😍😍😍 tsaka pag celeteque talaga alam ko high quality. Kaya gusto ko din celeteque e super ganda pa sa skin. Tsaka pwede sya sa lahat ng skin types. Yiiieh! Ang perfect tignan sa inyo madam! This Pink Orchid looks so Glam! From your swatches, it shows that its really pigmented and for me this is match for achieving simply natural look however the pricepoint of their makeups are bit pricey maybe due to they have incorporated anti-aging and skin nourishments on their products.